Wallpaper, still used in elegant homes, is returning as a decorating material in more middle-class homes. 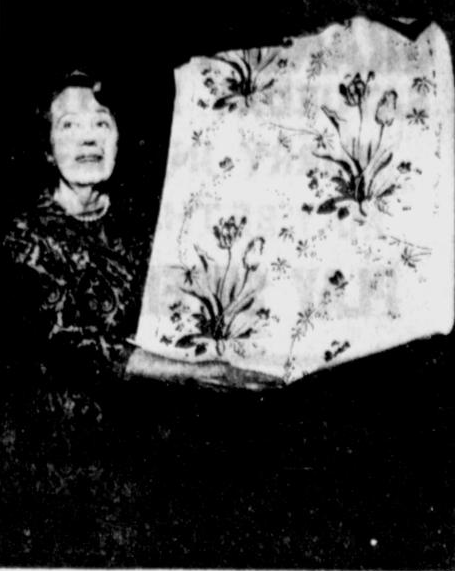 Inez Croom of New York City, a decorator and owner of a small wallpaper factory, talked about the history of handprinted wallpaper and its uses at Morgan Hall auditorium Thursday. Miss Croom was sponsored by the Alabama Chapter of American Institute of Interior Designers and the University of Alabama student chapter. Handprinted paper, unlike machine printed ones, have high-style design and use distinctive design, Miss Croom said. Her factory deals only with handprinted wall paper, often custom-made for clients. She said that until 1930 there were few handprint papers in the United States. About that time Nancy McClelland, for whom Miss Croom worked, bought designs from a French maker and began promoting them in this country. Handprints are made by silk screen process or by wood block printing. A design might cost about $250 and a screen for each color about $50. Thus handprint paper prices are higher than the quantity-produced machine papers, Miss Croom said. The first printed papers began in the 16th century, mostly in France, with wooden block printing. The "domino" papers were sheets about 12 by 16 inches and the colors were often stenciled by hand. The first papers were used to line shelves and drawers, and around fireplaces. Soon fabrics, velvet and damask, were imitated in the design. The first blocked papers came out about 1620 in France and looked and felt like fabric. Powdered wool was blown across a sticky varnish surface to produce the effect. About 1750 England had the corner on wallpaper making, shipping much of the product to France. Popular then were marbleized papers, made by floating dry colors on water, combining the colors into design and then dipping the paper into water. Also in the mid-18th century the Chinese began producing beautiful landscape papers reproductions of which now provide excellent backgrounds for Georgian American and English rooms, Miss Croom said. The first stencil papers made in China were painted on long rice panels. Italian landscape patterns were made with rollers instead of blocks. Wood block handprints are of more transparent color than screen prints, Miss Croom said. The designer showed slide pictures of rooms using wallpaper. She frequently uses paper printed to resemble wood molding and panels in a traditional room, and sets panels of floral paper between them. An Italian garden scene was used in one foyer to give formality to the decor and an adjacent "elevator room" used a similar paper with ballistrad. An octangular hall used panels of scenic prints of famous Paris monuments. Miss Croom said pictures should definitely be hung on papered walls. She said clients frequently hesitate, but she insists the walls should be broken up with something. Miss Croom pointed out that the Cupid and Psyche design used in the University Club is an excellent example of handprinted paper, beautiful for its drawing and composition.